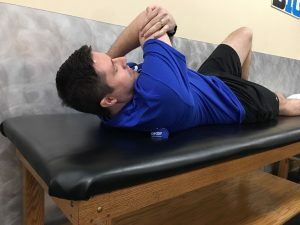 Sometimes the key to alleviating your pain or soreness is all about selecting the right tool and a massage ball might be your perfect new weapon to fight muscle pain. 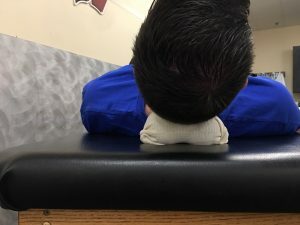 A massage ball has a few advantages over other tissue mobilization equipment. The massage ball is firm and contours well to muscles of all shapes and sizes. 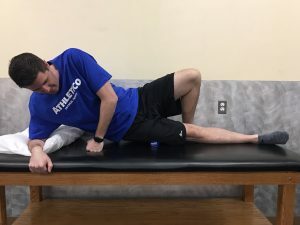 Due to its smaller size, it can be more effective at working the area between muscle groups and it also allows you to apply concentrated pressure to the muscle belly using your own body weight. Most importantly, the compact size of a massage ball allows you to carry it with you for instantaneous use. Tension is often held in our upper back and shoulders. Since this is a smaller area with lots of bony landmarks, the massage balls may be more suited to address these muscles. Laying on your back, place a massage ball between your spine and the shoulder blade you are wanting to work. Bring the arm, on the treatment side, across your body to help pre-stretch the muscle. Gently move your body, allowing the massage ball to work your areas of tightness. When you find areas in the muscle that feel tight you can relax your body weight into the ball, holding this pressure for 5-10 seconds. 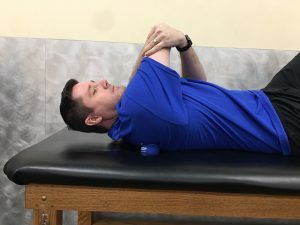 This allows you to release the tight tissue in the muscle with direct pressure. This position can be modified by performing the same activity except leaning against the wall instead of laying down. The bottom of your foot contains a lot of important tissue that can often become painful. One of the well-known structures is the plantar fascia, which is a band of tissue that runs from your heel to your toes. Still, there are small muscles in the bottom of your foot that can also contribute to foot pain. The massage ball is ideally structured for this area. Place the ball in the arch of your foot, then apply pressure down into the ball rolling it along the length of your arch. 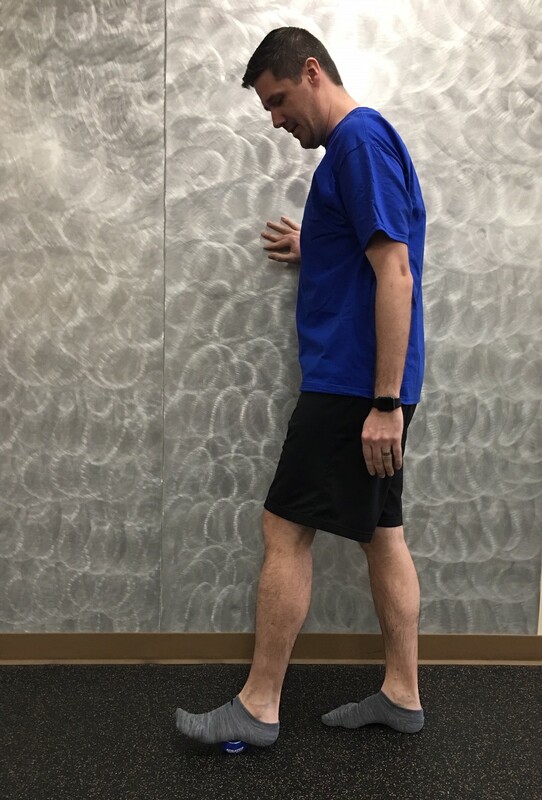 For increased pressure, stand up and shift the desired amount of weight onto the ball while rolling it along your arch. 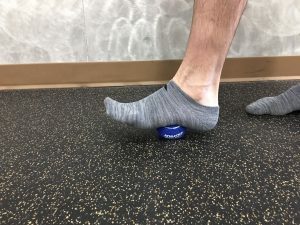 This will mobilize both your intrinsic foot musculature along with your plantar fascia. The IT band is a large band of tissue that runs along the outside of the leg. This structure has traditionally been mobilized using a foam roller and this is an effective means of treatment. Yet, a massage ball will allow you to aggressively mobilize very specific aspects of your IT band. Lie on the side that you are wanting to treat, placing the ball in the area of pain and tightness. Roll the ball along the side of your leg, allowing the weight of your body to put pressure onto the ball. Control the amount of pressure you are putting onto the ball by shifting your weight from your upper body down to your lower body. The calf musculature is important to assist in propelling you forward. Therefore this muscle is often prone to pain and tightness. Sit with your legs straight out in front of you. 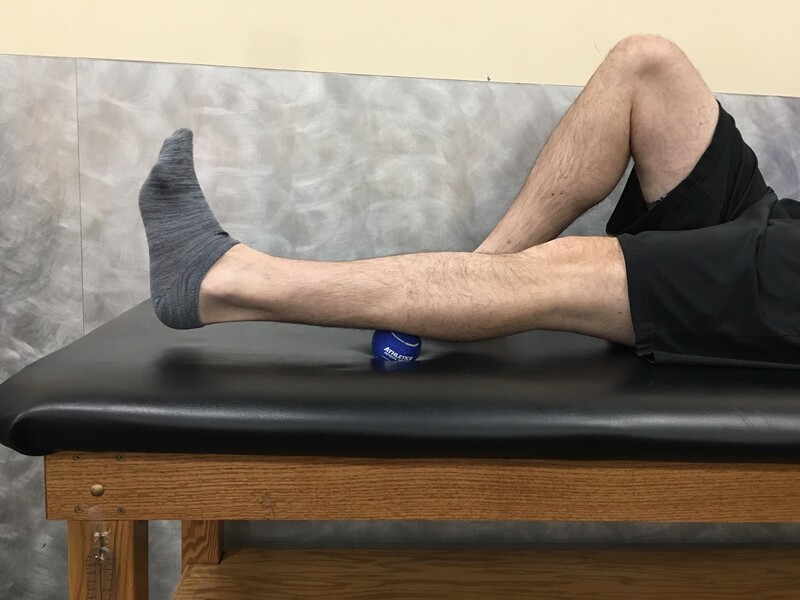 Place the ball on the area of soreness and roll the ball in all directions to mobilize the tissue making sure to apply the desired pressure. To assist with this mobilization “pump” your ankle while massaging the muscle. Two massage balls utilized together can also be used to work the muscles of the neck. This particularly small muscles along with the contour of our neck makes the massage balls an optimal treatment option. Place two massage balls in a sock and secure the open end. Now place the back of your neck in the “V” created between the two balls. Gently roll the massage balls up and down the neck helping to release the tension in these muscles. You can also move these massage balls to the base of your head and gentle relax into them. This can help release the tension in the neck musculature that is often associated with tension type headaches. 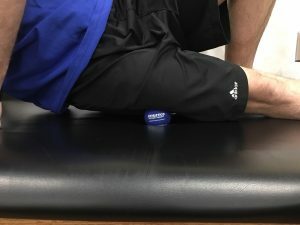 Ultimately the massage ball give you the right tool to uniquely address specific muscle pain that you might be experiencing. If you are having pain contact your nearest Athletico for a free assessment from one of our experts.